Tim Pawley, B.Sc. (Hons), M.Sc. 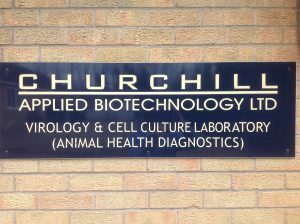 Churchill Applied Biotech nology Limited (founded in 1987) specialises in the propagation of a wide range of viruses of veterinary importance in order to provide inactivated antigens that can be used to detect antibody in serum samples as a signal of prior infection. The method of choice for antibody detection is the enzyme linked immunosorbent assay (ELISA), but we also support immunofluorescence and haemagglutination technologies. The presentation of our products is either in bulk for the manufacturers of diagnostic kits or alternatively in vials of lyophilised product containing sufficient antigen to coat one 96 well microtitre plate. For inquiries and orders, please contact Customer Services.